As a pacifist, I’m not really into explosive sounds that remind me of gunfire or bombs going off, so fireworks don’t do much for me. But this isn’t about me. This is about our canine friends. This past Sunday, a nearby neighbor started setting off fireworks (in anticipation of Independence Day, I assume), and little foster Chihuahua Sophia got a stricken look on her face. She’s not into loud noises, either, whether from fireworks or thunder. In fact, they terrify her. She was so scared that she followed me from room to room even while I was vacuuming, which is normally another sound that scares her. I understand that people want to engage in festive activities and that fireworks are exciting and thrilling, but really, they are just a form of entertainment―nothing more. Whereas to wild animals and to our canine friends, they sound like the end of the world. Dogs have been known to run away, breaking through screen doors and even glass windows in the process. Some dogs end up running into the road and getting hit by cars, or they just go missing forever. 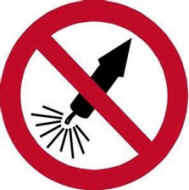 Animal shelters report an increase in the number of lost animal companions after fireworks events. I was very pleased to hear California Gov. Arnold Schwarzenegger discouraging Californians from buying fireworks. PETA sent him a letter praising him and suggesting that he go even further by promoting laser and light shows as a humane but equally impressive alternative to fireworks displays. Of course, his main concerns are public safety and the fire hazard of fireworks. But it would be lovely to see fireworks phased out of American culture altogether. I think the worst ones, from the point of view of dogs, are the ones that neighbors persist in setting off, because they’re SO close by. There’re only a few feet separating your dogs from that ear-splitting noise pollution. So it goes without saying that you should never, ever attempt to take a dog or any animal to a fireworks display―just the opposite: Try to shield them from the sound as best you can. A close cousin to fireworks anxiety is thunderstorm phobia, and many of the same safety principles apply: Make sure Fido is wearing a collar or is micro-chipped just in case he should somehow get out and run off, and never leave him outside. Let him go outside to do his business before the start of the fireworks or the storm, if possible, so that he won’t have to go out during all the scary racket. There is a great deal that you can do to comfort your noise-phobic dog. •Some veterinarians will prescribe heavy-duty medications, such as Valium, Xanax, Buspirone, or Anafranil, but there is a natural supplement (available at any health-food store) called “melatonin” that can be equally effective. Melatonin is a synthetically produced hormone used by humans with insomnia to help them sleep. But in dogs, it can really take the fright out of thunderstorms and calm them right down. The dosage is 6 mg for 100+-lb. dogs; 3 mg for 50-lb. dogs; 1.5 mg for 30-lb. dogs; and 0.5 mg for 10-lb. dogs. A very small percentage of dogs might have the opposite reaction (excitement) when given melatonin, so test it out when there is no sign of a thunderstorm in sight. Another option is the flower essence Rescue Remedy for dogs who have a mild case of anxiety (also available at the health-food store). •Behaviorally, the most important thing that you can do for Fluffy is to avoid “enabling” her, i.e., don’t validate Fluffy’s fears. Contrary to the way we primates operate, if you comfort Fluffy in a sympathetic fashion when she’s fearful, then she’ll feel that she’s right to be scared, and her fears will just get worse and worse with each new thunderstorm or fireworks event. Instead, you should go about your business normally and interact with her in an upbeat and confident manner so that she can see that there’s nothing to be afraid of. You might even give her a new toy beforehand to distract her with. If you can get her to show the slightest sign of calmness, such as wagging her tail, instantly give her a luscious treat to reinforce that behavior. A few years ago on the Fourth of July, right after I had adopted Sunny and Dexter, I could see that both of them had the potential to become freaked out by noises, so we spent that warm summer evening outside on the deck and I clapped my hands and exclaimed, “Yay!! !” every time we heard an explosion. I am not kidding you. I’m sure my neighbors thought I was insane, but it worked and neither of them has fireworks or thunderstorm phobia to this day. •As for the dog’s immediate environment, muffling the sound of the fireworks or thunder is very helpful. You can close all the windows and either turn on some white noise, such as a fan, or put on some canine-soothing music, such as the specially formulated music discussed in and produced by the authors of Through a Dog’s Ear. With regard to the lightning often accompanying a thunderstorm, some dogs do well if you turn all the lights on to mask it, while other dogs prefer to have their eyes covered. There is even a product called the “Calm Night Pet Hood” that is purported to calm dogs down via sensory deprivation. And many dogs seek out small rooms with no windows to hide in. •Dr. Nicholas Dodman, veterinarian and professor at Tufts University and author of the books Dogs Behaving Badly and The Dog Who Loved Too Much, has postulated that dogs are really freaked out by thunderstorms because of a buildup of static electricity in their coats that gives them periodic shocks. He says that this is why you will find that many dogs take shelter in bathrooms with tile floors during storms. He suggests several anti-static measures, including rubbing dogs down with anti-static laundry strips, making sure dogs stay on tile or linoleum, or just putting them in the car. All of these measures will keep the static electricity from building up and shocking them. [We] have made it through two nights of thunderstorms without a glitch! I can’t freaking believe it, but I pieced together this part that worked a little and that part that worked a little, and we’ve gotten it down I hate to jinx it, but those were the calmest two nights of storms in almost four years. And one of them shook the house. … As soon as [my dog] wakes me up, which is typically before I hear thunder (I can tell what’s wrong by her state of panic), I praise her for waking me up (just as if she were waking me to go out or for an intruder), I turn on the overhead light to make it so bright in the bedroom that she can’t see the lightning (and sleep with it on), I calmly tell her we’re going to get her pill, she walks to the kitchen, I give her 1.5 mg of melatonin, I put her in bed with me (she typically refuses to sleep with me), I cuddle her close on one side and push a pillow up to her close on the other side, I cover her eyes with a dark T-shirt/towel and I pet/massage her and talk to her calmly until the melatonin kicks in. She’ll peek out a couple of times, and I let her and just tell her it’s OK. Then we both get to go back to sleep and she doesn’t move until the storm is over! WOW! Amazing. I was seriously at a loss for giving her any comfort at all. And some dogs are fine with thunderstorms and fireworks all their lives and don’t have a single problem with them until they hit old age, when something changes along with their hearing. This is what happened to my sweet Koro. When she reached the age of 12, she suddenly developed geriatric thunderstorm anxiety and would hide underneath the kitchen sink when they approached. As mere mortals who want to shield our beloved dogs from terror, there’s not a lot we can do to prevent acts of God, such as thunderstorms. Fireworks, on the other hand, are completely human creations and could be stopped tomorrow. What a wonderful thought!